Central Yankee Town, West Caicos. The iconic Burrell Traction Engine at Yankee Town. 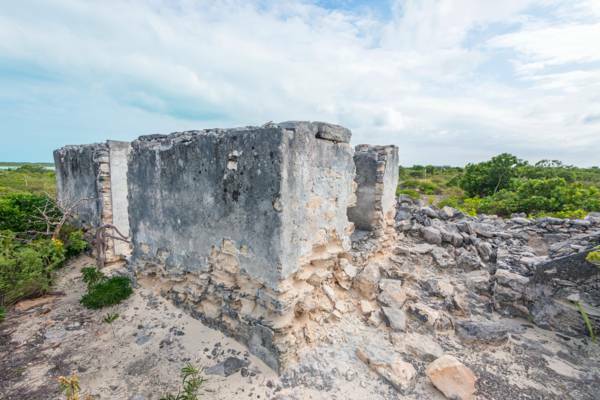 Found on the remote central west coast of West Caicos, Yankee Town is a late 19th century abandoned and ruined settlement. Established by the West Caicos Sisal Company in 1891, this site was the base of operations for sisal and cotton planting. Due to the contained nature of the settlement and certain historical features, Yankee Town is one of the finest historical sites in the Turks and Caicos. 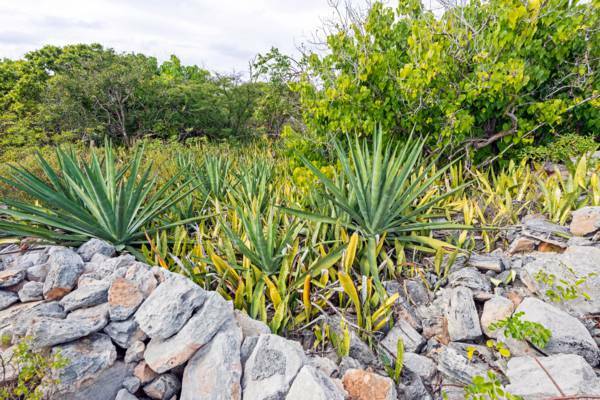 Unlike the late 18th century Loyalist era plantations on North Caicos, Middle Caicos and Providenciales which mainly focused on Sea Island Cotton, the fibrous agave sisal was the primary crop on West Caicos. After initial processing, the fibre extracted from the long leaves of the sisal plant was exported for rope production. Of all of the major agriculture attempts in the Turks and Caicos, the Yankee Town plantings of West Caicos were the shortest-lived. Although obvious care and attention went into the construction of the settlement, the site and parent company was operational for only one decade and work ceased in 1903. Evidence suggests that financial mismanagement prematurely put an end to the business. About seven stone buildings, several cisterns, wells, the machinery, and the railroad are the remaining standing testaments to Yankee Town. 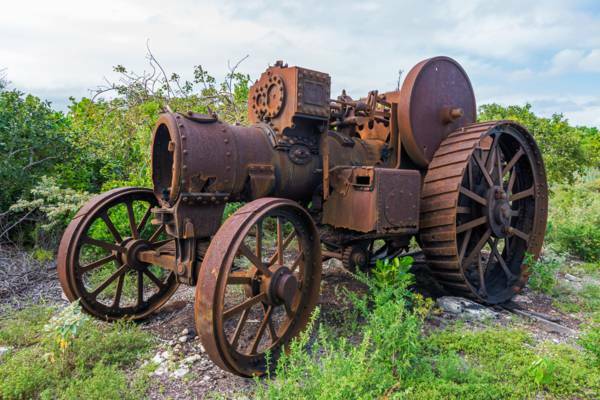 Several pieces of interesting antique heavy machinery still stand in Yankee Town. The best-known is a largely-intact and massive Burrell Traction Engine, a precursor to the modern farm tractor. Although the sheet iron boiler and tanks have seen serious corrosion and decay, the cast iron components have actually fared quite well considering the marine environment. This circa 1904 steam “road locomotive” was built by Charles Burrell and Co in Thetford, England, and was commissioned by Pita Ltd (pita is a synonym for sisal). There is however somewhat of a mystery over the initial intended destination for the engine. Records indicate that the machine was destined for West India, and was mistakenly shipped to West Caicos in the West Indies. The 1904 manufacture date of the tractor appears to back this up as Yankee Town would have been largely defunct by this year. Another beautiful piece is a primitive internal combustion engine, a Crossley horizontal kerosene (paraffin oil) engine, produced in Manchester in England in the final years of the 1800s. This engine appears to have been set up to run large belts, probably to turn pumps, or possibly T. A. Smith’s patent “Fiber Decortigating Machine”, which was used to process sisal leaves. It’s quite fascinating to see a prime example of the transition point in history when the steam engine conceded to the internal combustion engine. Several boilers, and a pump still remain hidden in the low vegetation as well. 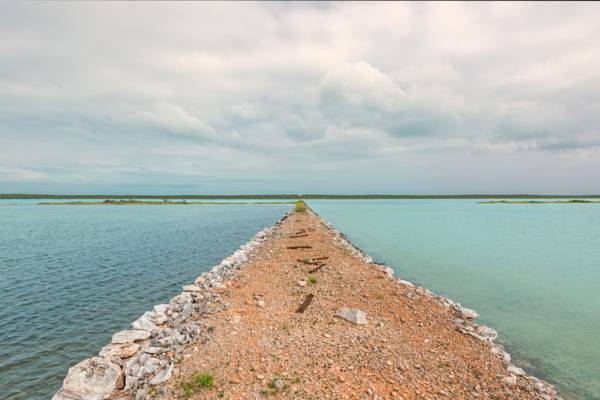 The railroad causeway across Lake Catherine, West Caicos. Built to facilitate efficient movement of the sisal crop, a rock causeway with a small gauge railroad was constructed across the central Lake Catherine. This system supported donkey-drawn rail carts, similar to what was used in the guano cave excavations on East Caicos. Contrary to the railroad on East Caicos which utilised wood sleepers (likely sourced locally), stamped sheet metal sleepers were chosen for West Caicos. Although pressed out of a thin ferrous metal, the majority remain intact despite the high salinity of adjacent water. The railroad also features another unique sight for the Turks and Caicos: a rail cut through a small limestone hill. Sisal plants, remnants of those raised in the past, at Yankee Town. As was likewise the case with a few of the larger sea salt production firms that operated on Grand Turk, South Caicos and Salt Cay, the West Caicos Sisal Company issued token coins as payment to its workers. Stuck from nickel and brass by S. H. Quint of Philadelphia, United States, these tokens were produced in one and two shilling, sixpence, threepence, penny, and halfpenny denominations. These tokens were only accepted in the company store, which definitely limited the financial freedom of the field workers. Although the grounds surrounding Yankee Town are relatively open, access remains difficult due to the general location and remoteness of West Caicos. 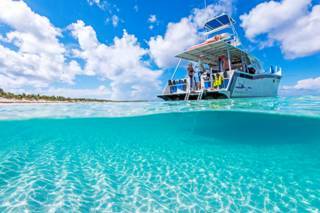 Several of the Providenciales boat cruises do occasionally visit the excellent nearby snorkelling sites of the West Caicos Marine National Park, and it’s often a possibility on such an excursion to swim ashore and scale the low coastal cliffs to visit to Yankee Town. To get the most from your visit, you may want to consider going with a knowledgeable outdoor guide. Yankee Town is not an official tourist attraction and as such has no safety considerations or paths onsite. Many of the buildings and features are crumbling, and numerous deep wells and cisterns are hidden in the underbrush. Care must be taken to avoid injuries. As a valued and important historical site, do not vandalize or harm any feature. Do not take any artefacts found on the island. The interior Lake Catherine is a nature reserve and highly important to many types of coastal and wading birds. Avoid entering this region. 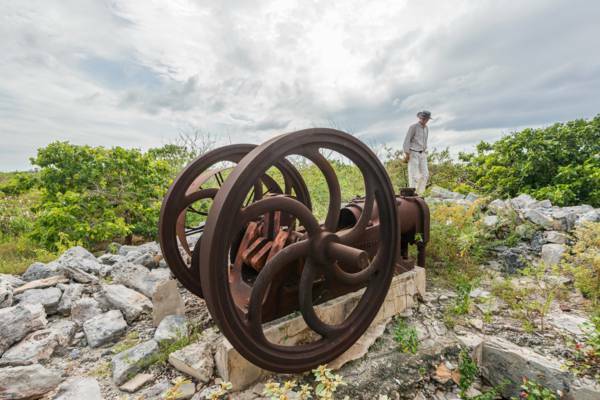 Recent proposed changes (ongoing from 2015) to the Turks and Caicos National Parks Ordinance have considered forming a new protected historical site that would include Yankee Town and much of the rail causeway. It’s expected that these proposals will go through.